Cakes & More: Kiwi Quark Mousse - With Zespri Kiwifruit! 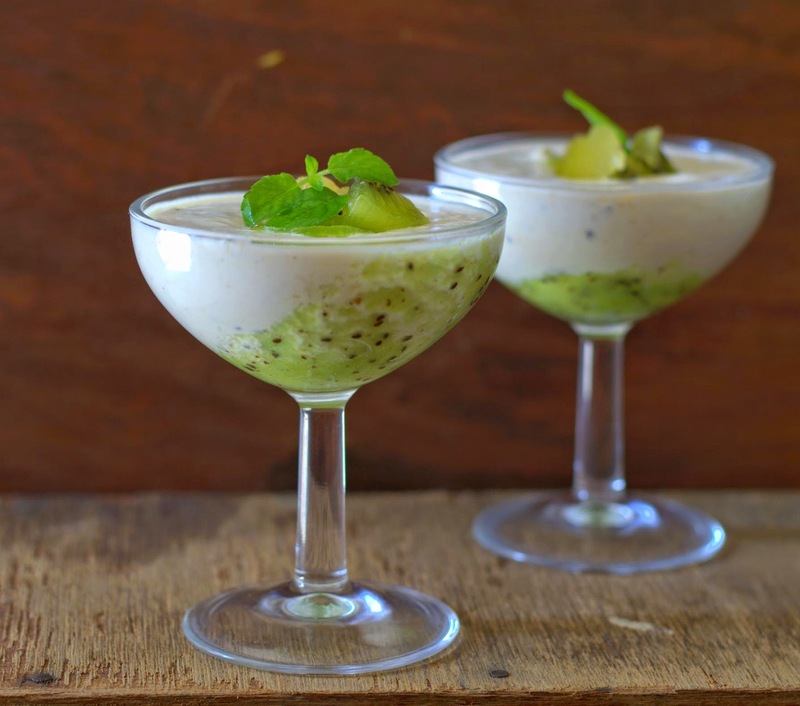 Kiwi Quark Mousse - With Zespri Kiwifruit! Kiwifruit aka Chinese gooseberry. Familiar, but not quite. But fascinating it has always been! The egg shaped, far from attractive fuzzy exterior, reveals a pretty seed flecked interior in an intriguing shade of green. And now a gorgeous yellow too I discover, thanks to this event by Zespri International at ITC Gardenia last month. I know this post comes late, blame it on the festive season, the inevitable sweets and savories galore. And then some! At ITC Gardenia, Chef Yogen Datta and team demonstrated a few recipes to showcase the versatility of the fruit which can be used in everyday dishes as well as exotic ones. Kiwi Cheesecake, Carpaccio of Kiwi with Silken Tofu, Rucola, Kiwi & Rosemary Salsa, Sushi with a Kiwi twist, Kiwi Caprioska and Kiwi Sangria were among those demonstrated to us. Zespri International is owned by over 2,500 kiwifruit growers of New Zealand. They claim that the fruit they grow comes with the highest assurance of quality. Along with the conventionally grown fruit, they also sell organic kiwifruit, both green and yellow. The fruit always comes with a Zespri sticker, so be sure your fruit has it if you are looking for those grown by them. Zespri Green Kiwifruit are tart-sweet, sweeter when ripe. The yellow ones, Sun Gold Kiwifruit are sweeter with a tropical flavor. The green ones sometimes may need to be stored for sometime before they are ripe enough, whereas the yellow ones are always ready to eat. Choosing and storing : Look for plump fruit with a smooth skin and no bruises. If you are looking for ripe ones, choose those which yield to gentle pressure. Those not ripe yet can be left on the counter for a couple of days to ripen. If you want to hasten the ripening process, put the kiwi in a paper bag with a banana or apple. When it is ripe enough and you don't want it to ripen further, store in the refrigerator for 1-2 weeks. I gather, the fruit is enjoy best chilled and is ripe enough, but not mushy! Mushy ones can probably be used in smoothies. To eat the ripe fruit, just cut it into half, scoop the flesh out and dig in! The flesh of the Kiwi fruit is very soft and you could cook it into mush in a matter of seconds. I prefer to eat it as is or as a topping or in a salad or just pureed to use in a dessert. Nutrition : Nutrition dense kiwi fruit is supposed to be very rich in calcium, potassium and fiber. It has a very low glycemic index too, perfect for the health conscious! Here is what I made with the fruit. As I mentioned earlier, the kiwis got my attention a bit late! A simple yet refreshing Quark Mousse topped with Kiwi Fruit. I have been dreaming of this as a filling in my cake since the time I made this mousse. 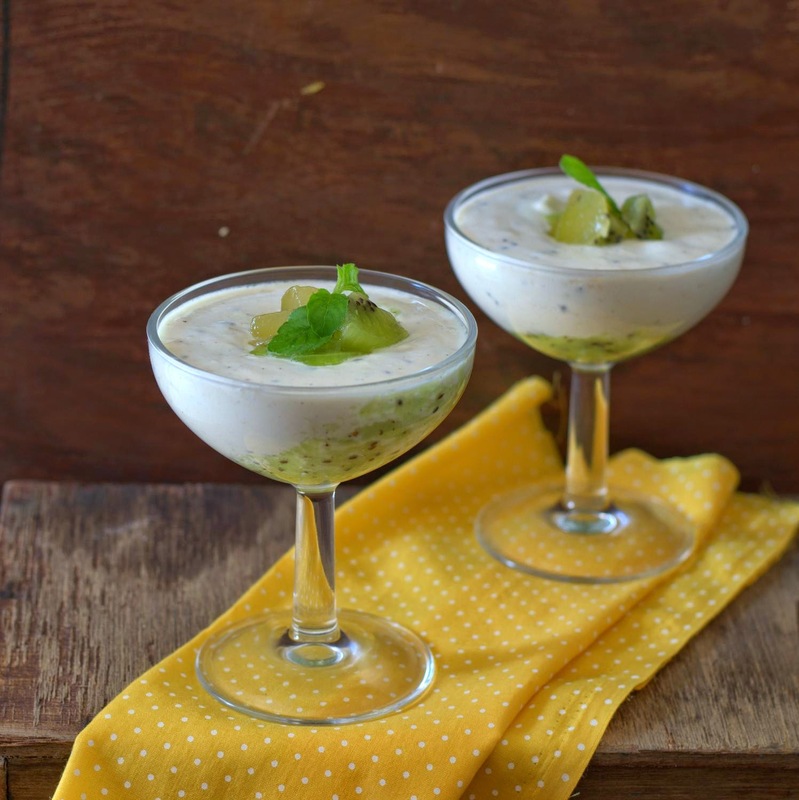 Kiwi Quark Mousse : Inspired By Deeba Rajpal. Sliced Kiwis and fresh mint for garnish. Method : Whisk together the quark, sugar, vanilla and kiwi fruit puree. Whip the cream to soft peaks. Gently, fold it into the quark. Spoon into dessert glasses. Cover with cling film and chill for 4-5 hours. Garnish with fresh kiwi slices and fresh mint leaves just before serving. Please note : If using unsweetened cream, add more sugar as needed. You may also need to stabilize the mousse with agar agar or gelatin. In the picture above is with Amul cream which did not hold up very well. It works very well with non-dairy cream though. Add a touch of wholesome green or yellow to perk up your salad or dessert with some kiwifruit for a change! 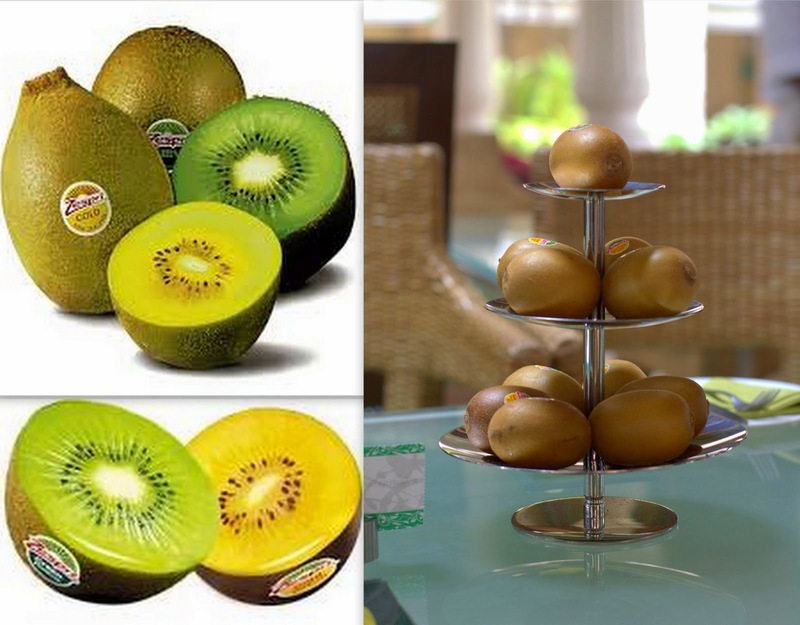 For more information on Zespri Kiwifruit, please do check their website. Crisp Apple Crumble - Tailor Made For Everyone!